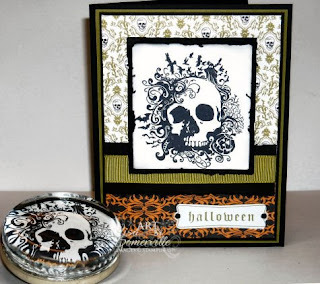 I just recently received the new From the Crypt set from Stampin' Up! I was happy so see some "out of the box" type of artwork in the new Idea Book & Catalog. There's a few sets that have more of a grunge type of look, and for Halloween, this is a great look! If you look closely at the skull, you'll see bats, birds, pumpkins and even a ghost in the flourishes around his head. The focal image is stamped in Black on White card stock, sponged in Grey. I used the Torn Frames Technique (from a past TJNL issue) on the Black panel behind my image. I popped this panel on dimensionals over the Cast-a-Spell DSP. The sentiment was created using the Spooky Treats Rub Ons and the Modern Label Punch. The paperweights I've had in my alterable stash - I purchased them last year at the Dollar Tree. ouie booie.......my type of guy! Love this! totally cool!!!! love the paper weight!!!! Wow! This is awesome! I didn't realize this was an SU! stamp....so un-SU like! Oh, this looks great! I did some of those paper weights last year with Fleurs. They look great with that skull!